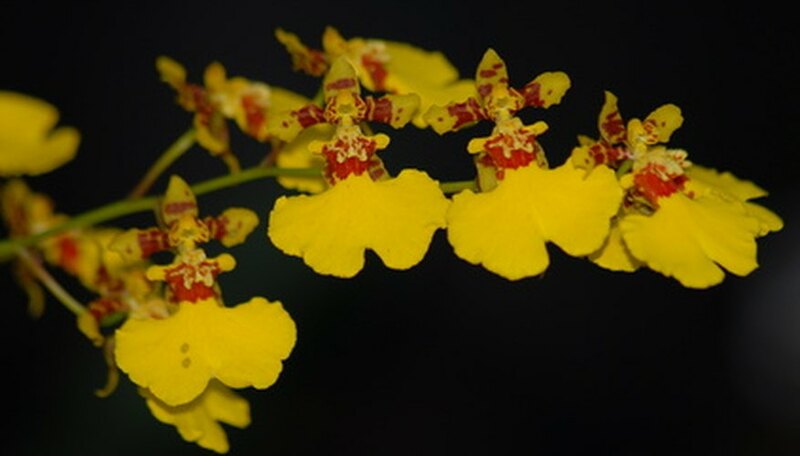 Different types of orchids grow in different types of soil. One common type of orchid is the kind that grows from bark or living, dying or dead trees. These orchids grow above the ground and sometimes form a symbiotic relationship with the host tree. Other types of orchids, like North American lady slippers, are called terrestrial orchids. These orchids grow on the ground in the same kinds of soils as other forest ground plants. Orchids generally grow under the shade of a taller forest canopy. This arrangement helps keep sun off the soil and reduces solar evaporation. Whether you are growing aerial orchids or terrestrial orchids, this protection from the sun helps to keep roots and soil moist. Orchids that grow in nature on the surface of trees will do exceptionally well in a potting medium made of chopped fern, chopped bark, porous stone or peat. Orchid species accustomed to taking nutrients from bark can survive very well in pots filled with these materials. In some cases, the roots from these aerial orchids may grow outside of your pot. Do not worry about this; after some time, the roots can add visual interest to your orchids. Terrestrial orchids are the type that grow on the ground. Standard potting soil can work, if it has a high organic content from things like leaves or chopped bark. However, most potting soils are too dense for orchids. Add a third to a half peat, chopped bark or compost to potting soil for a good orchid potting mix. If possible, the pH of the orchid soil should be between 5.5 and 6.3. Because orchid growth media has such high organic material content, you may not need to fertilize your orchids. However, the University of Florida suggests applying fish emulsion to your orchids every couple of weeks during the growing season. Although orchids will grow in most pots, the pot must allow excess water to drain away from the roots. Terrestrial orchids do well in standard pots with a single hole. However, if you are planting aerial orchids in a bark-type medium, plant them in pots with side holes, mesh pots or wire pots. For aerial orchids, the purpose of the pot is primarily to hold the growing medium together so it can be encased by the orchid roots.